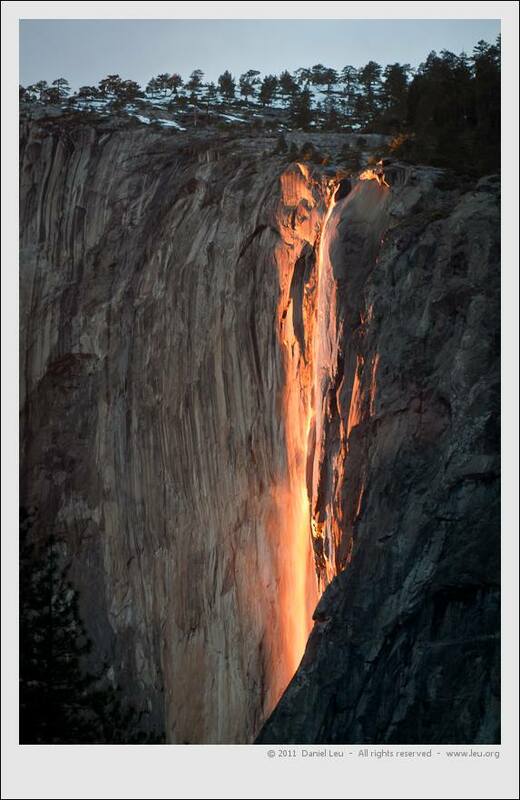 During February for about two weeks, the setting sun just touches the Horsetail Waterfall in Yosemite and creates something that looks like the old Glacier Point Firefall. In order to see the effect of the natural “fire fall”, there must be sufficient water flowing, some wind to generate the mist, and the sun should not be obstructed by clouds. Two years ago, I got an idea of how this might look, but Sunday night the spectacle happened in full force. It lasted a full 10 minutes. If you google a bit, you will find plenty of people talking about this and showing their captured work.